The Naga Bhut Jolokia, also known as ghost pepper, is a chili pepper previously recognized by Guinness World Records as the hottest pepper in the world, with a Scoville rating from 855,000 to 1,463,700 (for reference, the jalapeno is 3,500 - 8,000). The Trinidad Moruga Scorpion is currently the world's hottest Chili pepper cultivar. The New Mexico State University's Chili Pepper Institute has identified the Trinidad Moruga Scorpion as the newest hottest chili pepper in the world as of February 2012. According to the New Mexico State University Chile Institute, the Trinidad Moruga Scorpion ranks as high as 2,009,231 SHU on the Scoville scale, making it the hottest chili pepper in the world to date. For reference? Law enforcement grade pepper spray has a Scoville rating of 1,500,000 - 2,000,000. The ghost pepper is an interspecific hybrid cultivated in the Nagaland and Assam region of northeastern India and parts of neighbouring Bangladesh. 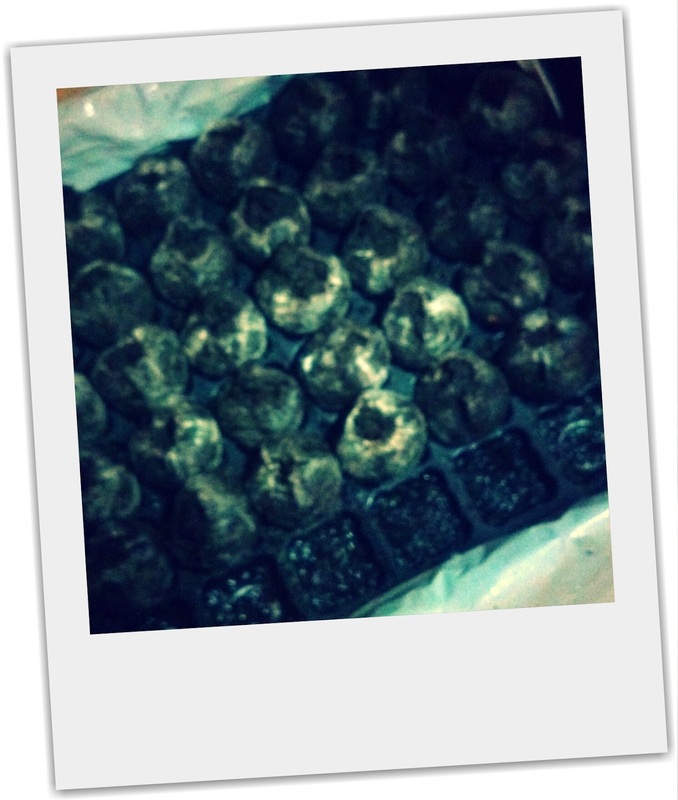 It grows in the Indian states of Assam, Nagaland and Manipur. It can also be found in rural Sri Lanka where it is known as Nai Mirris (cobra chili). 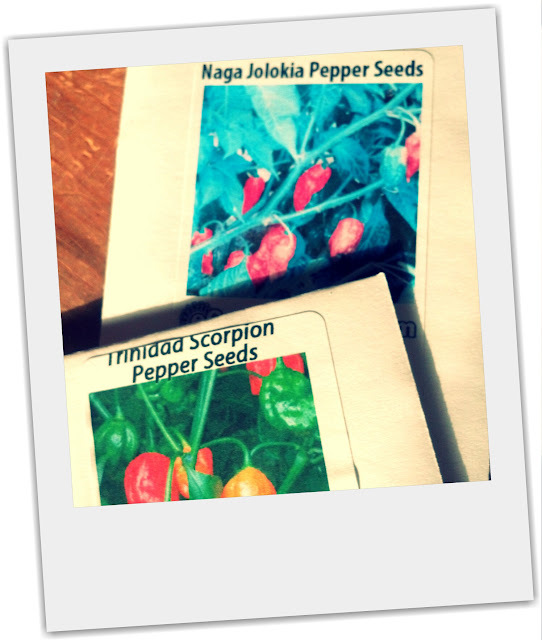 The Trinidad Moruga Scorpion pepper is cultivated in (go figure) Trinidad. 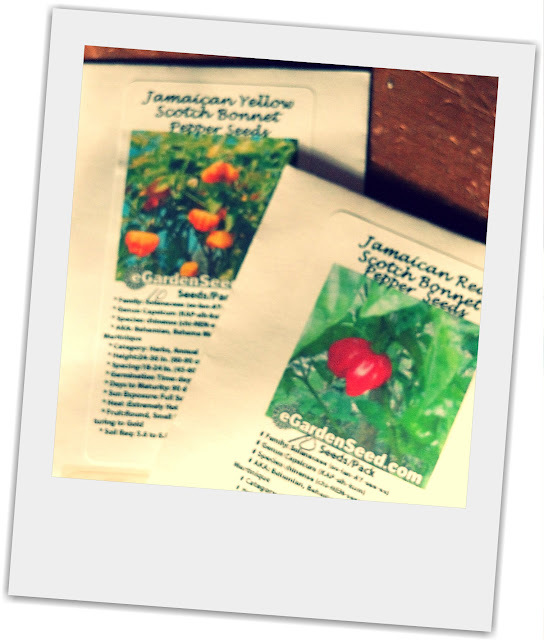 We purchased seeds for the ghost and scorpion peppers as well as two different varieties of Scotch Bonnet peppers (with a comparatively mild Scoville rating of 100,000 - 350,000) and have planted them. 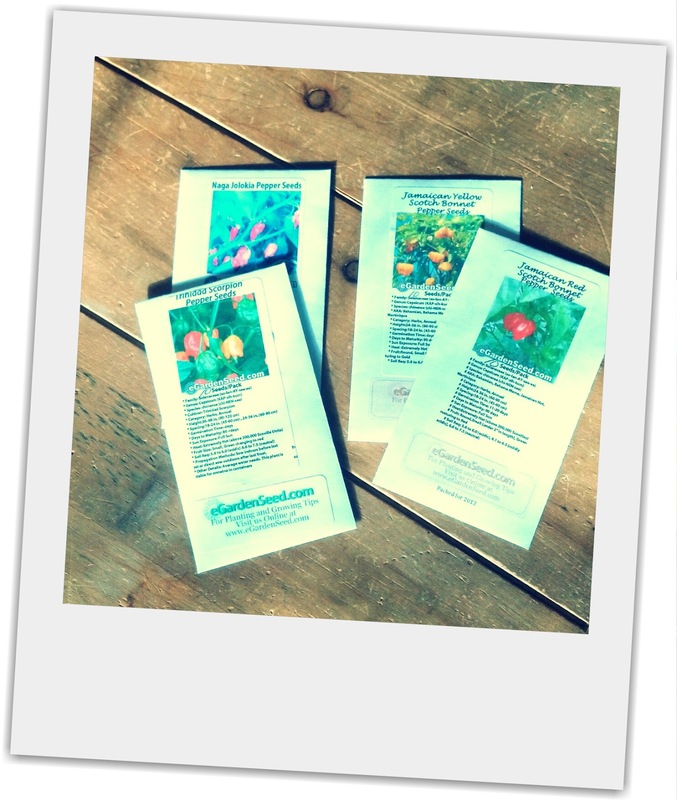 10 seeds of each of the four varieties. 40 plants. That's a lot of hot. Remember the hottest wings ever? The wings we ate at Smalley's Pirate Bar? The wings that Guy Fieri had problems eating? Soon we'll be making our own! Did I just say "Soon we'll be making our own!"? Apparently, we never learn. Would you eat something made with ghost or scorpion peppers? New ghostie or old ghostie? wow!! exciting! the heat is definitely on! Tuesday Garden Party - Ghosts! Tuesday Garden Party - Growing Salsa! Tuesday Garden Party - A Wishing Well!